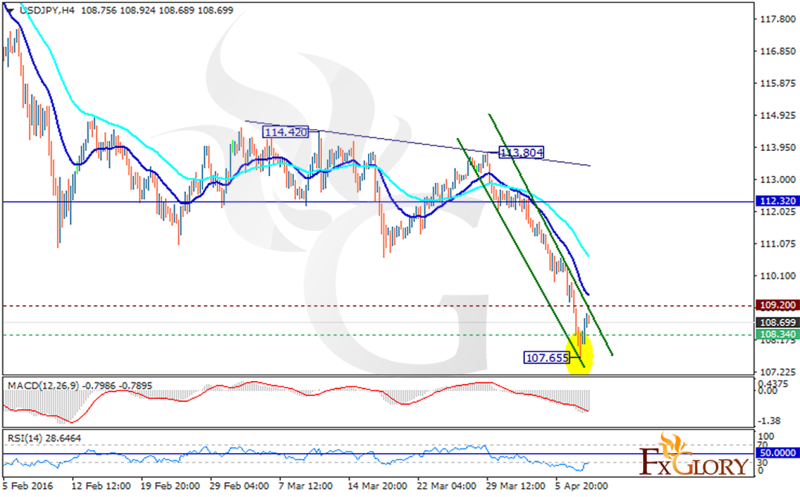 USDJPY is under the influence of Tokoyo shares which fell and the oil price which grew. Yesterday it continued its decline and reached 107.655 but early today it moved up again. Despite the fact that the demand for safe assets had supported Yen, the pair cannot exceed the descendant channel and will continue its bearish trend. The support lies at 108.34 with resistance at 109.200 both below the weekly pivot point at 112.320. The MACD indicator is in negative territory signaling the price decline along with the RSI below 50 level confirming this plot. The EMA of 20 is located below the EMA of 50. Short positions are recommended with the target of 108 and 107.